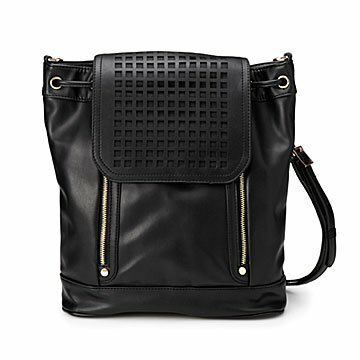 Keep essentials organized with this stylish vegan leather bag that has a pocket for almost everything. Choose between fashion and function? We'd never make you. This fun, textured backpack has a compartment for every essential. Organize pens, IDs, metro cards, and other smaller items in the front zippered pockets. On the inside, stow larger items in the spacious interior, and up to two water bottles in the elastic holders. Keep valuables like cash or jewelry in a more hidden snap-closed pocket. The back of the bag has a compartment that's just the right size for your tablet, so you can take your work or reading on-the-go. Crafted from vegan leather, it's a stylish gift for eco-conscious loved ones who always need more room in their bag (who doesn't?). Made in China.